Usain Bolt offered professional football contract by Central Coast Mariners - How much is it worth? The eight-time Olympic champion has reportedly been offered a professional contract by Australia's Central Coast Mariners, according to his agent Ricky Simms. Here's all that you need to know about it. 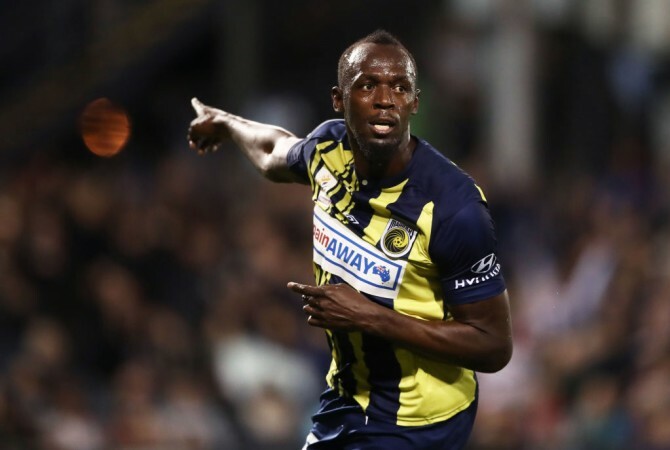 Sprint legend Usain Bolt has been offered an official A-League contract by league minnows Central Coast Mariners, his agent Ricky Simms has confirmed. The eight-time Olympic champion, who joined the Australian top-tier football side on an indefinite training period in August, is considering his options, according to The Sydney Morning Herald. Bolt had retired from track and field in 2017 and immediately shifted focus to realising his dream of playing professional football. After having training stints at Bundesliga giants Borussia Dortmund, South Africa's Mamelodi Sundowns and Norway's Stromsgodset, the 32-year-old arrived in Australia in a bid to earn a professional contract from the Mariners. Bolt has reportedly been offered a deal worth $150,000 per year, which is quite less to the $3m that his management had discussed initially with the club. The contract was offered to him over the weekend by the Mariners, according to the news daily. The sprint king did not travel to Brisbane for their season opener against Brisbane Roar but stayed back in Melbourne mulling about the deal. Notably, the Mariners held the Roar 1-1 after taking the lead on the road as early as in the fourth minute in the Suncorp Stadium. Mariners coach Mike Mulvey though insisted after their Sunday's match that he was not made aware of any such development. "I do appreciate how important this story is for the rest of the world. But you have a look at our frontline today and you wonder if he could get into any of those positions, wouldn't you? I don't know anything about what you're talking about and that's god's honest truth," Mulvey said. Considering Bolt's lack of professional experience, it might not be easy for him to deny the $150,000 contract. Money from commercial endorsements and sponsorships is always going to come his way as he is expected to draw huge crowds in Australia. Notably, more than 6,000 fans had gathered to watch Mariner's pre-season friendly against NPL side, Macarthur South West United in Sydney last week. Bolt did not let his fans down by scoring a double in their 4-1 win. Bolt has seemingly improved as a footballer quite a bit after joining the Mariners, but as Mulvey suggests, he may not yet be good enough to earn a professional contract. Notably, the Jamaican star hasn't played against an A-League side yet. The 100m and 200m world record holder had recently declined a two-year contract from Maltese champions Valletta FC.